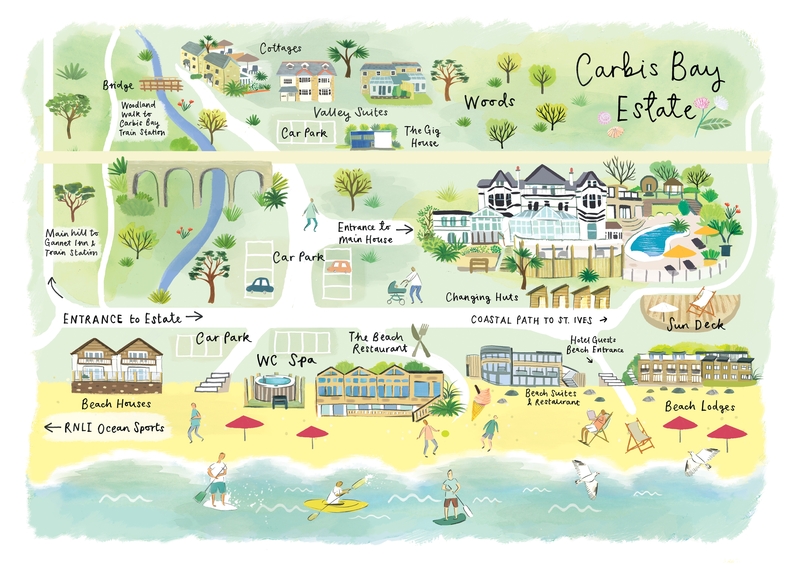 Whatever your mood, The Carbis Bay Estate has all the ingredients for the perfect holiday. Enjoy 125 acres of comfort and relaxation. Try one of our 46 individually furnished rooms or the luxury of our coastal properties, and relax on our privately-owned 25-acre Blue Flag beach. Central to everything is the main house, a white-walled landmark designed by the celebrated Cornish architect, Silvanus Trevail and erected in 1894. Inside, gilt mirrors and chandeliers are complemented by modern, chic interior touches. Along with 45 individually furnished rooms and sea-facing suites, you will find here the Sands, a fine-dining restaurant boasting two AA Rosettes and featuring Cornish produce, and the light and airy Conservatory with far-reaching sea views. Equally stunning is the Godrevy Room for events or, private dining, the peaceful Silvanus Trevail Lounge and the Boardroom for conferences and meetings. The multi-award-winning C Bay Spa, although part of the main House, enjoys a secluded location with its well-loved facilities and relaxation zones. Above the year-round heated pools stands the Pavilion, uniquely positioned for treatments or even an intimate wedding ceremony. From there, various verandas and terraces float down through subtropical gardens towards the private beach – and the South West Coast Path passes by on its way to St Ives. Our Carbis Bay Beach has Blue Flag and Seaside Award accreditation – we are the only UK hotel to boast this – and offers almost a mile of soft, golden sand and sheltered waters. Halfway along, you’ll find the Ocean Sports Centre, offering tuition and hire of paddleboards and kayaks. Look for our Beach Club Restaurant with its informal "Mediterranean" appeal and open-air hot tub above the sands, backed by another Spa treatment suite. For the ultimate in beachside living, consider our new Beach Lodges featuring spacious ocean-inspired interiors, the latest technology, roof gardens, beach gardens and alfresco private hot tubs. To follow is our opulent Ocean event venue with an events and dining suite and further accommodation on the beach. The Estate additionally stretches back up the wooded valley where, beyond a tree-hugged stone viaduct, hide a range of serviced coastal properties. We also offer further options within a few minutes' walk or drive, including the cosy Gannet Inn. We have been awarded many local and national accolades acknowledging the effort of all of our staff.